We have exciting new products from Caution, Ocean Rodeo, LWD, Gaastra also in stock. The Caution Answer II was a big improvement in stability for novice riders while still retaining good turning and grunt. We are looking forward to another new kite from Caution as well. Ocean Rodeo has come out with a new version of the Rise which incorporates top to bottom vents to increase performance even further. This kite has the power of a much larger kite while maintaining great turning and a very simple bar and bridle set up. Gaastra is back out with several rangy SLE kite models this year at very good prices and a full quiver of excellent twin tip boards at equally great price points. Peter Lynn is one of the most prolific kite designers in the world . Forty years of designing kites in addition to bringing in highly qualified engineers and professionals with vision outside the status quo has brought out water kites that are far more stable with fantastic water launch and user friendliness, while at the same time, maintaining high performance and unmatched durability. Five years ago, these kites were boasting flight characteristics that other kite types are just now starting to achieve. Designed in New Zealand, PL traction kites far pre-date kitesurfing with application towards buggy traction kiting, snow board, and cross continent snow kiting among others. As a proud USA Peter Lynn Distributor, we serve those that follow logic and not the masses. We have been using, testing protos, and riding PL kites on water, snow and land from the C quad and first water foil proto kites way back. Great value and great technology in a kite that works equally well for snow kiting or wave sailing. Baja’s thorny shores and rocky point are a walk in the park for these kites. Great in Gusts - A stiff framed kite will not absorb a gust like a softer kite will. The jolts go through your lines and are dissipated by your body. I don’t know about you, but we prefer to do without the extra traumas on our shoulders, backs and knees. 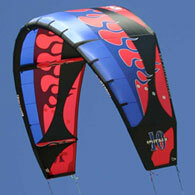 PL kites are a great compromise between stiffness for performance and user friendliness. Drop your Kite with Confidence - Drop your kite confidence! They tumble in the surf with no stiff frame compromise. Unlike Peter Lynn kites, LEI stiff frame kites have a stiff frame which makes them FAR more likely to rip up in the surf. PL kites also float for very long period of time and act well for floating in emergencies. We have found kites floating in kelp beds a day and a half after someone had lost his or her kite. Don't buy into the hype. No Bladders to Fix - No bladders to fix! Ever! If you somehow manage to catch the kite on a cactus (happened to a customer) or drop the kite on a sharp rock, throw it back up in the air and it will still fly. After your session, fix the rip with a piece of sail repair tape. Easy. Ask our users or go to the arcusers group to learn more about these great kites that are made for 99 percent of the kiters out there. When it comes to a leading edge inflatable kite that is built for durability and quick turning for wave conditions, Santa Cruz's Caution kites are the stand out. The Santa Cruz gang are fellow equipment thrashers in the worst surf and wind conditions they can find. The Caution Kite brand stands out amongst other LEI kites for these qualities and their continued C kite construction. We are currently testing all the flat style leading edge inflatable kites that have just come to the market this year. 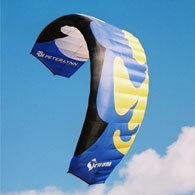 These kites offer extended wind range and depower and unlike other leading edge inflatable kites. Like all kites, however, there are pluses and minuses. BOW kites are much like the original flat Peter Lynn C Quad kites, but with inflatable spars, which allow angle change to dump excess power. This flat surface can dump a bit more wind than a standard flat inflatable kite but has different turning, jumping, landing and other flying characteristics. We will be stocking the brand we find most user-friendly while maintaining safety and great performance. Many companies share a common patent for these kites and it comes down to execution and application. If interested, please feel free to consult with our team on these kites. To read our preliminary review of the Globerider Sonic bow kite, click here.